Or at least close enough. Little details to follow when time allows, but the hard work is out of the way. This was as much an experiment as it was an attempt to recolor my car for the season. I despise old fiberglass and spider cracks. I hate repairing it even more, so I decided, with zero experience, to try and wrap the car with vinyl. Shockingly, I’m overall pretty happy with how it turned out. Before this my experiences with vinyl were severely lacking. The most I’d ever done were flat panels, which take practically no effort so taking on some of these complex curves was a bit daunting. It’s a 10/10 (10 ft/10 mph) job and if you get up close you can see my mistakes. Some random bubbles and creases in a few of the panels. And if you’re really observant can figure out which panels I started with and which were at the end because I got seriously better with each panel. All in all I estimate that I have roughly 30 hours in the vinyl work. And it is ALL vinyl. The car was originally white, but had faded and stained into a beige-ish, off white with lots of little black cracks propagating over every panel. I did each panel independently and tried to work with single sheets of vinyl. The white vinyl is a much brighter white and in a few spots you can see the old paint underneath and can see how bad it looked. I suspect in doing vinyl the amount of time from start to completion is on par with paint. It’s an improvement if you consider the time of letting the paint dry and then applying any top coats. Not to mention all the prep work. The upside is that if I ever want to redo it I can without hours and hours of sanding. I HATE sanding! I had always been skeptical about attempting to wrap a car myself, but after this experience I would recommend it for anyone that thinks they’re up for it. Get a good heat gun, a decent squeegee, and a quality vinyl in double the amount you think you’ll need. Here are a few things I learned along the way that should help anyone on the fence about trying it. 1) Always start in the middle of the piece and work outward. Mostly, I worked in a hemispheric pattern working the top half then bottom half, circling 180 degrees back and forth. 2) Use heat only when you have to. Every time you stretch the vinyl it ends up expanding compared to the surface area you want to cover. If stretched too far I ended up with a bunch of excess and had to fight to avoid creating creases. Big creases are the worst! Pull on the vinyl a little when applying heat. You can feel it start to stretch and can see the area become taut. Then squeegee it down. 3) Buy good vinyl! Something that has good stretch capabilities and has air release tech in it. I started with 3M (1080 Scotchprint), but switched to Avery (Avery Supreme) mid way and ended up preferring the Avery. It stretches further and is more willing to shrink. Sometimes when I would get excess vinyl buildup with the 3M I had to peel it off and start again or risk a big crease. The Avery Supreme was capable of shrinking a fair amount with pressure and made it easier to squeegee out any potential creases. The 3M is also tougher to pull apart when it inevitably gets stuck to itself. 4) Don’t be afraid to peel back and rework a section if it’s getting tough to work on. 5) On complex pieces, like the nose, there will have to be seams. Leave a 1/4” to 1/2” overlap at the seam and allow it a few days to set before trimming it back. The vinyl will shrink after a fe days and if the overlap is too small it will shrink back far enough to reveal what’s underneath. 6) Don’t rush. Take you’re time. Sometimes when working over large areas it is easier to make small, incremental progress over an area then try to do big sections all at once. I found some of the simpler pieces were more troublesome than the complex ones because I would try and work them too fast then have to go back and rework my mistakes. 7) Only use heat when you have to........redux. It is possible to over stretch vinyl. First, if you go too far it will tear. But, even if you avoid tearing it there is the possibility of the color tearing. On one section of red I stretched it too far and the color had light and dark spots from where it was over stretched. I ended up doing that piece in two sections with a seam instead of trying to make one piece stretch too far. I have no idea if that occurred with the white as I can’t see any spots due to the white paint underneath, but I’m sure it happened. 8) Clean the pieces multiple times before applying the vinyl. I ran into a few spots where some small dirt particles were on a panel and ended up under the vinyl. They’re permanently attached now. Secondly, when working the edges (think edge of a door where you want to wrap it around to the backside) any dirt/oil/debris will spoil all chances of getting a good adhesion. Clean those spots even better because if it pulls up at all you lose the nice clean finish. I didn’t clean the underside of my engine cover very well and the vinyl won’t stick the whole way around. It all culminated with displaying the car at a local C&C type event called Rears and Gears that’s held in the metro Detroit area throughout the summer. The venue rotates to interesting local auto theme/inspired places and this time held at the local electric kart track. I was asked to bring my car in to display, which was really cool. It also forced me to finish the car a few days early since I plan on doing an initial off season shakedown this weekend. 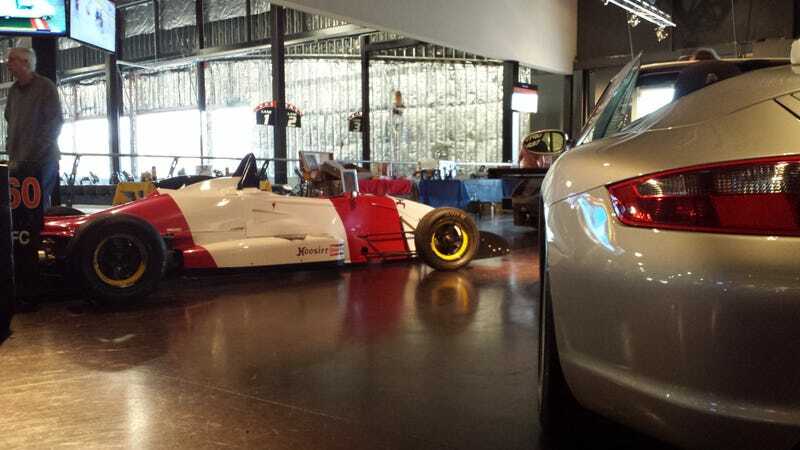 Sitting in front of my car was a 2000 Cadillac LMP car. It was very cool to be included with such fancy machinery.